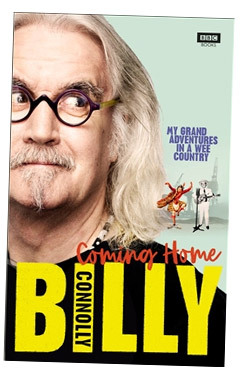 Billy Connolly is to make a major new BBC series about his native Scotland. Coming Home is described as a 'unique and intimate portrait' of his homeland, and will carry extra poignancy because of the comedian's struggles with Parkinson's disease. Only this weekend, Michael Parkinson revealed how Connolly's memory was fading, leaving him struggling to recognise even his oldest friends. But reminiscences are the bedrock of Coming Home, as his excursions around Scotland have been prompted by key artefacts such as a first pressing of a Hank Williams album (the first record he ever owned), Landseer's Monarch of the Glen and a bottle of air that recreates the smell of the old Glasgow Docks. The new series, set to launch this autumn, is described as a 'shaggy dog quest to find out what that 'something" was and whether it is still there'. On Saturday, Parkinson, 83, told TV chef James Martin: 'The sadness of Billy now is that wonderful brain is dulled. The company previously made Billy And Me, the 2017 ITV documentary celebrating the comedian's career. Now 75, Connolly was diagnosed with Parkinson's in 2013. At the time he also revealed he was suffering from deafness and prostate cancer. Coming Home will also be accompanied by a book, subtitled My Grand Adventures in a Wee Country and published on October 18. The BBC has not yet responded to Chortle's request for comment.